I’ve always been fascinated with the history of Alcatraz. I remember watching The Birdman of Alcatraz when I was young, and of course I totally loved Escape from Alcatraz and The Rock. And I was totally wowed when I visited the one-time prison and got to talk to a former guard. Wow, did he ever have some stories to tell. So you can imagine how thrilled I am to hear about a new exhibit coming to San Francisco — Alcatraz: Life on the Rock. 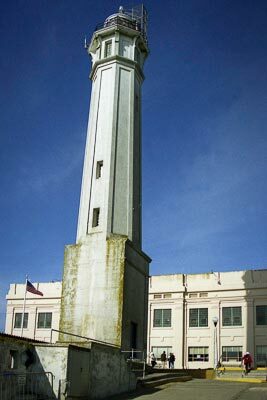 This museum quality exhibit, which is made possible by a collaboration between the National Park Service and Alcatraz Cruises, will focus on the many eras and stories of Alcatraz Island. The exhibit is slated to open on May 1, 2013 in the lobby of the Hyatt Regency San Francisco. It will run through July 31, 2013. Best of all, it’s free. Highlights of the exhibit will include an original letter written by Robert Birdman Stroud when he was an Alcatraz prisoner; an Alcatraz shank made from a butter knife and wrapped in electrical tape, and an original brass key to an Alcatraz visiting room door. I’m also happy to report that there’s barrier-free access throughout the public areas of the Hyatt Regency San Francisco, so this special exhibition is a great choice for wheelchair-users and slow walkers. Just take the elevator up to the lobby and enjoy. And while you’re in the city, make plans to take a little trip over to The Rock. 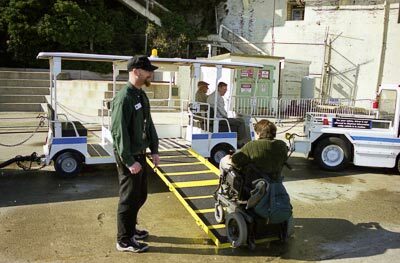 Although the cell house is at the top of a hill, disabled visitors can take advantage of the SEAT shuttle service to get there. Wheelchair-users can just roll aboard the accessible shuttle for the short ride. Up on top, there’s good access to the main floor of the prison. All of the boats out to Alcatraz are wheelchair-accessible too, but plan ahead because tickets are almost never available on a walk-up basis. So pick a date and buy your tickets well in advance at Alcatraz Cruises. You can even print your tickets at home, so you can bypass the ticket line. Have a great time exploring Alcatraz, and at Alcatraz: Life on the Rock. I know I will! This entry was posted in Destinations, Events, Events and tagged Acatraz Cruises, accessible travel, Alcatraz, barrier-free, disabled travel, Hyatt, San Francisco, slow walkers, wheelchair by Candy B. Harrington. Bookmark the permalink.